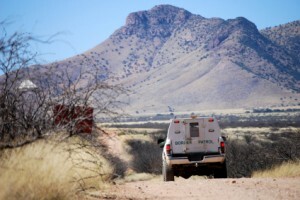 Drug smugglers have tried all kinds of clever – and not so clever – ways to get their products across the Mexican border and into the U.S.
On Tuesday morning, Border Patrol agents in the Tucson Sector seized nearly $100,000 worth of marijuana dropped from an ultralight aircraft Tuesday, AZ Family reports. The ultralight was was spotted by CBP camera operators. Agents found 10 bundles of marijuana wearing roughly 185 pounds. Agents arrested two Mexican nationals. Posted: 11/7/14 at 9:12 AM under News Story.